The most troublesome aspect of an emergency is the element of surprise that it presents. You just never know when it’s lurking around the corner. But if you have some learned responses in place, an emergent situation doesn’t have to become a disaster. When it comes to oral health, accidents and sudden trauma can occur just like with any other part of your body, and that’s why your Winthrop dentist wants you to have some information to rely upon if you have a dental emergency. Learn more about how to cope with these situations as you read further. 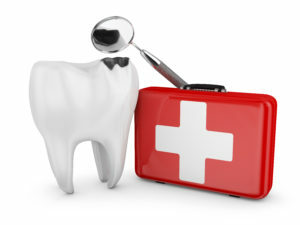 A dental emergency is any situation that causes a sudden, adverse change to your oral health. It can also be a situation where a pre-existing situation has reached a crescendo and is causing major problems. Dislodged Tooth – This is a situation where the tooth has completely been knocked out of the mouth. It’s something to especially be on the lookout for in contact sports or any event where a ball or apparatus can strike the mouth. Cracked-Broken Tooth – A cracked or broken tooth is also considered to be a dental emergency. A lot can happen with that tooth, from infection to eventually falling out, so it should not be treated lightly. Severe Tooth Pain – Severe tooth pain can be classified as a dental emergency because it could be a sign of advanced tooth decay. Furthermore, it could require an emergency root canal to prevent it from being lost. The pain could also be the result of a bad infection. Either way, this issue needs to be addressed as soon as possible. Laceration – A cut to the soft tissue areas of the mouth can cause bleeding. Whether it’s an emergency will depend on how much blood is lost and whether the bleeding stops. Reinsert the Dislodged Tooth – If your tooth has been dislodged, wash your hands thoroughly and grab it by the crown. After soaking it in water or milk, carefully place it back in your mouth in its proper place. Then try to hold it there until you can be seen by your dentist. Stabilizing a Cracked-Broken Tooth – When you have a cracked or broken tooth, rinse your mouth well with warm water and if there is bleeding, then bite down gently on the tooth with a cotton gauze. For any swelling, apply ice to the outside of the affected area. Addressing Tooth Pain – In cases of severe tooth pain, rinse your mouth with warm water. You can also gently floss between your teeth to make sure that there isn’t any food lodged that’s causing the pain. Stopping Bleeding of a Laceration – In the case of a laceration, gently clean the area and apply a cold compress to lessen any swelling. If the bleeding won’t stop, then you need to go to the emergency room. The most important thing to remember in the event of a dental emergency is not to panic. Recall the above information and recommendations to stabilize your situation. Also, be sure to reach out to your dentist in Winthrop so that you can be seen as soon as possible, and he will help you return to your fully functional state. Dr. Howard D. Brooks received his BS degree from the University of Massachusetts in Amherst and then went on to earn his Doctor of Dental Medicine degree from Boston University School of Graduate Dentistry. A member of the American Dental Association, Dr. Brooks practices at Brooks Dental P.C. Cosmetic Specialists and can be reached for more information through his website.